Hard-hitting, heartbreaking and horrifically topical documentary that deserves to be seen, though the film leaves you feeling angry and powerless as you realise that the damage has already been done. Written and directed by Shannon Walsh, H2Oil is a hard-hitting documentary about the devastating environmental impact of the Alberta Tar Sands project on both the local community of Fort Chipewyan and, by extension, the rest of the world. The film examines the horrific side effects of oil production, particularly in relation to the pollution and exhaustion of the local water supply. Walsh illustrates the technical side of things with a series of animated inserts and her own narration, but the human impact is felt through the stories of several individuals: local doctor John O'Connor, who's alarmed at the sharp increase in cancer cases but falls foul of big business when a health authority accuses him of spreading undue alarm and professional misconduct; Allan Adam, who runs for Chief of the First Nation community, vowing to fight oil sands development; activist George Poitras, who has a gift for showing up during political appearances and asking embarrassing questions on camera; and Aaron and Cathy Mather, who are devastated by the impact of the drilling on the natural spring that feeds their bottled water business. With the recent disaster in the Gulf of Mexico, the issue of oil pollution is more important than ever and when the narration warns of a potential disaster that could be three times as big as Exxon Valdez it seems like prescient foreshadowing. Similarly, it's immediately clear that government and big business are willing to turn a blind eye to the ecological devastation because of the billions of dollars that stand to be made – it's hard not to get a sinking feeling when even Barack Obama is seen talking about measures that don't even begin to address the problems of Fort Chipewyan. There's very little to be cheery about in H2Oil, but the Allan Adam's election victory does offer a tiny ray of hope and the community's defence of O'Connor is genuinely moving. However, the upbeat moments are vastly overshadowed by depressing, upsetting or rage-inducing moments, such as the photos of the cyst-infected fish or the revelation that an ex-vice president of energy company SunCor is now in charge of approvals for all Tar Sands projects. 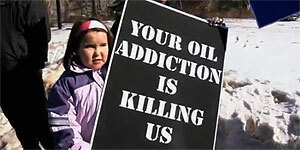 H2Oil is a hard-hitting, if thoroughly depressing eco-documentary that demands to be seen.